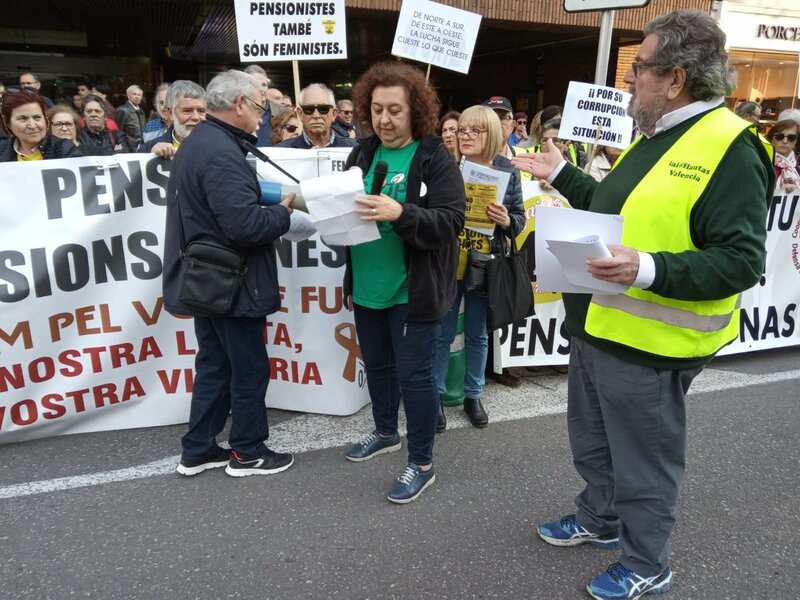 As a consequence of the housing emergency that has arisen in Spain, with 184 evictions of family homes per day and over 3,4 million of empty homes, the ordinary people have organized and all the PAH groups are involved in the PAH Social Action (Obra Social PAH). PAH Social Action consists on the recovery (for social housing) of empty apartments and buildings currently possessed by financial entities that have been bailed-out with billions of euros drawn from public resources, from the Spanish taxpayers. This campaign advocates for Human Rights claiming to comply with the constitutional right to a decent housing in opposition to the State’s Institutions that bend to the interests of the economic and financial powers. On October 16ht, 2013 in the neighborhood “Barri del Crist” (Aldaia, Valencia) – a working class neighborhood with an unemployment rate higher than the Spanish average- in the outskirts of Valencia (Spain) the PAH’s of the province of Valencia recovered a seven-home apartment building owned by then by BMN (Banco Mare Nostrum who has been bailed-out 3 times with public resources: 915 mill. euro on 2010, 730 mill. euro on 2012 and 230 mill. euro on 2013), shortly afterwards during the last bailout operations, the bank passed the property to the SAREB (the public bank created by the Spanish Govt. to concentrate toxic assets). The building was renamed as “Ca Esperança” (Hope Home in Valencian language), and it began to burst with life and hope to its inhabitants, generating a space of collective organization and advocacy of our basic rights. Today, 9 adults and 4 children coexist in an environment of solidarity and mutual support, of collaboration and learning, where resources, knowledge and skills are shared to keep families from breaking apart and to save 13 human beings from physical and mental suffering. We learn to search for a job on the social networks, we produce handcrafts, and we collect school materials, clothes and home appliances for families that are in the same distress as we are. The children living in Ca Esperança have already been evicted once from their original homes, have been already stigmatized by capitalism, they suffer from nightmares and wake-up troubled in the middle of the night fearful of having a troop of riot-police breaking into their homes to kick them to the street again with nothing but the clothes they’re wearing. We are decent families widely supported by our neighbors, which we are trying to prove collecting all these signatures, and we receive demonstrations of support every day, like the stores and supermarkets that often donate food and basics to sustain our families. We are families threatened by social exclusion and who have exhausted all the institutional channels to access to a social housing. Now we have been sued for encroachment by the SAREB and face criminal prosecution. SAREB has been funded with billions of euros from Spanish taxpayers and we have repeatedly requested to facilitate social housing to Ca Esperança inhabitants (and other families in distress throughout Spain out of the thousands of properties that now they hold). The 2nd Courthouse of Torrent (Valencia) has dictated a precautionary eviction order with no fix date, the most cruel and complicated eviction to appeal. Any day, any time, as of the 9th of June, riot-police troops can execute the eviction of Ca Esperança, hence the tenants are completely terrified by this situation. This eviction would be a flagrant breach of the verdict issued European Human Rights Court of Strasbourg who has stated that evicting a citizen without guarantee of a housing alternative infringes the fundamental rights, therefore, it is mandatory for the State to guarantee the relocation of every evicted person. To the present date, all these families who have been neglected by the SAREB, the Municipality of Aldaia, and the Valencian and Spanish Governments, are reaching out all citizens, social movements and civil rights organizations to request the endorsement of this Manifest, as it is the best weapon to fight for our rights. #SOSCaEsperança” and stating your full name or organization name, and your location. NO HOMES WITHOUT PEOPLE, NO PEOPLE WITHOUT HOMES! For a stock of social housing with SAREB’s empty properties! We appreciate your support. Together we can!